June the 26th was our annual show, although rather wet and miserable in the morning, it didn’t stop exhibitors turning out, we were fortunate to have excellent entries of quality ponies and cobs forward. Once again we are grateful to Mr and Mrs Gee for the glorious venue with Llanllyr Mansion in the background. 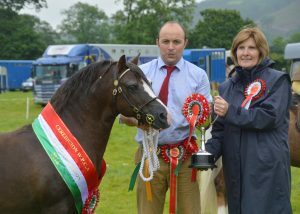 President for the day was Mrs Carys Davies, Trefaes Stud and her choice of Supreme Champion was the Section A Stallion Friars Jackpot owned by The Glyncoch Stud he was superbly shown by Adrian, In reserve champion was the Ridden Champion Cadlanvalley Georgie Girl property of the Cadlanvalley Stud and ridden by their Grand-daughter Libby Grota. We thank Mrs Davies for her presence and generous donation on the day.